The climate in East Gippsland is temperate, with patterns of precipitation and temperature influenced by geography, topography, altitude and proximity to the coast. Temperature varies according to proximity to the coast and altitude. The plains and coastal areas are subject to mild temperatures. For example, Bairnsdale averages temperature highs of 20.6°C throughout the year, with annual average lows of 9.1°C. In January, Bairnsdale averages maximums of 25.8°C and lows of 15°C. During July, Bairnsdale averages a maximum of 13.7°C and a low of 3.8°C (BoM). Temperatures at Cann River (the northernmost BoM weather station in the region) are similar to Bairnsdale, only it is typically a little warmer during the day and cooler than Bairnsdale at night. Average temperature highs of 20.5°C are experienced throughout the year, with annual average lows of 7.8°C. In January, Cann River averages a maximum of 25.9°C and a low of 12.4°C. During July, Cann River averages a maximum of 14.3°C and a low of 2.1°C (BoM). Mild winters are experienced on the plains and in coastal areas. Higher winter temperatures compared with other parts of the region are a result of winds becoming warmer when descending from the mountains (ie. the Fohn effect) (LCC, 1982). The Great Dividing Range is the dominant landform feature in the north of the region, and has a significant influence on weather patterns. Dry ‘rainshadow’ valleys contrast with adjacent mountains that are characterised by wet montane forests and, at higher elevations, sub-alpine woodlands and alpine herbfields. 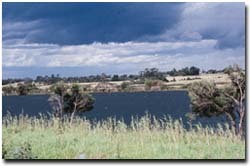 Rainshadows caused by the ranges occur in the Mitchell and Tambo River valleys, and on the plains. Rainshadow effects are evident when comparing average annual rainfall of 659 mm at Tabberabbera in the Mitchell River valley with Bullumwaal in the bordering high country which receives an average of 1 080 mm per annum. Mean annual rainfall at Bairnsdale is 716 mm and at Cann River is 1 008 mm (BoM). Precipitation mainly falls as rain, except at high altitudes, where areas over 1 500 m elevation remain snow-covered throughout winter. Maximum rainfall occurs in winter and spring, and high-intensity rains at any time of the year can cause floods in the lower reaches of most major rivers in the region. On the coastal plains, rainfall is fairly evenly distributed throughout the year. Source: C of A and State of Victoria (1999) and Bureau of Meteorology Climate Averages Website. A range of climate and weather data is available from the Bureau of Meteorology website. The Bureau of Meteorology website provides a regular radar update (external link) covering a 256 km radius from Melbourne. Bureau of Meteorology. Climate Averages Website. Commonwealth of Australia (C of A) and State of Victoria (1999). Gippsland Regional Forest Agreement: Comprehensive Regional Assessment. AGPS, Canberra. Land Conservation Council (LCC) (1982). Report on the Gippsland Lakes Hinterland Area. Land Conservation Council. Melbourne.